"Irish comedy, potato, potato, potato, potato, potato, potato, potato, potato, potato, potato, potato... you racist." This comedy trio have sold-out Edinburgh Fringe shows from 2009 to 2016. 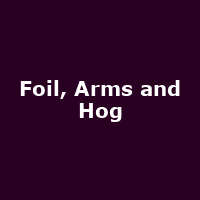 Sat 18th May 2019 Foil, Arms and HogThe Corn Exchange (Cambridge)More Info..